An extraordinary opportunity to own this luxury estate bordering raw 80 acres annexed by the Town of Strathmore. The security gate leads to a tree lined paved driveway to this luxury executive home, presented in absolutely pristine condition. The home features gorgeous design, high end finishes, warm tones & spacious layouts, perfect for family living. Entertain in the receiving room, formal dining area, chefs kitchen or the full width no-maintenance deck. Play in the rec room with wet bar, sunken indoor hot tub & tv/theatre area. Enjoy hobbies in the covered sunroom or the sensational shop (5000 SqFt). The manicured grounds offer full irrigation, dedicated garden plots, gorgeous tall trees & beautiful blossoming foliage and ornate shrubs. 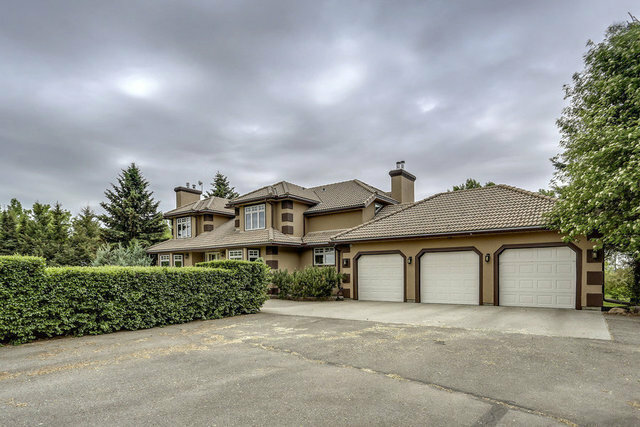 Extremely private, yet ideally close to Strathmore or routes to Calgary. This property offers superb investment and future development opportunity. A truly rare opportunity! Thoughtful build details of this home include basement floor radiant heat, fire suppression system, gated entrance, heated floor in masters en suite, jetted en suite tub, security privacy shutters, triple paned glass (N side) and low E windows, heated oversized garage w/epoxy floors, 2 wells (one for home, the other for the shop), and even retro fitted to run off an independent power supply. By appointment only - Guard Dog On Duty!